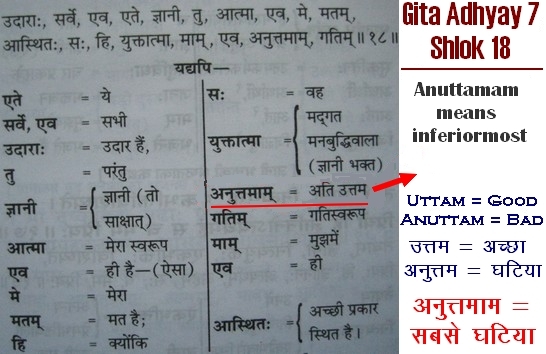 In Gita Adhyay 2 Shlok 12 and Adhyay 4 Shlok 5 and Adhyay 7 Shlok 18, it has been stated that I (the giver of the knowledge of Gita) am perishable. Birth and death, mine and yours, will always keep on occurring. Only the performed deed (Karm) will be attained; there is no liberation. Although those who do my sadhna are noble worshippers, but they are also engaged in my very bad (Anuttamam) sadhna (worship). Translation: (Na, tu) neither (ev) is only (aham) I (jaatu) at any time (na) not (aasam) was, or (tvam) you (na) were not, or ( ime) these (janaadhipaH) kings (na) were not there (ch) and (na) nor (ev) is only (ataH) this (param) beyond (vayam) we (sarve) all (na) not (bhavishyaam) will be. Translation: Neither it is that I was not there at any time or you were not there or these kings were not there, and nor it is that we will not be there beyond this. Translation: (Parantap) Oh Parantap (Ajun) Arjun! (me) my (ch) and (tav) your (bahooni) several (janmaani) births (vyateetaani) have passed (taani) them (sarvaani) all (tvam) you (na) not (vetth) know but (aham) I (ved) know. Translation: Oh Parantap Arjun! You and I have had several births. You do not know all of them but I know. Translation: (Hi) because (me) my (matam) in opinion (ete) these (sarve, ev) all of (gyani) knowledgeable/learned (aatma) souls (udaraH) are noble (tu) but (saH) he (mam) me (ev) only (yuktaatma) engrossed soul (anuttamam) my very bad salvation (ev) only (aasthitH) are dependent. Translation: Because in my opinion all these learned souls are noble, but that soul engrossed only in me is dependent only on my very bad salvation. The meaning of Gita Adhyay 7 Shlok 17 and 18 is that even my i.e. Brahm’s bhakti is done by four types of bhakts. 4. Gyani: a sadhak who read the Vedas and found that one gets a human life only to attain God and that the bhakti of only one Supreme God is beneficial. Because of not finding a Tattavdarshi Saint, who is mentioned in Gita Adhyay 4 Shlok 34, considering Brahm only as the Supreme God, he kept doing Kaal (Brahm) sadhna which is said to be very bad i.e. even Brahm sadhna is inferior. That is why in Gita Adhyay 18 Shlok 62, 64, 66, it has been said that go in the refuge of that Parmeshwar/Supreme God, and He only is also my Venerable God. Read Gist of Bhagavad Gita Chapter 18. Request: The sadhna of the above-mentioned three mantras is available with me, the servant of the servants (Sant Rampal Das), which Supreme God KavirDev has Himself granted by having mercy on His souls. Because now the intermediate (middle) generation is going on. Because in the beginning of Kalyug1 , our ancestors were uneducated. At that time the fake saints, gurus, mahants and Aacharayas did not let the Tatvgyan of the Supreme God come up, and at the end of the Kalyug all the people will become devoid of Bhakti and highly vicious. Now this present time, the educated society, has begun from the twentieth century. This is intermediate (middle) generation going on i.e. the human lineage. The actual knowledge is present in our true scriptures, which the fake saints, gurus, aacharayas and mahants could not understand. As a result of which, the whole devotee society, on the basis of the knowledge opposite to the scriptures, being based on the baseless stories (lokved), abandoning the injunctions of the scriptures and by following the arbitrary way of worship, is wasting the precious human life. 1. In the first stage, Brahm Gayatri mantra is given, which is to open the Lotuses. The devotee who will obtain initiation will think that Guru Ji was saying that we do not have to worship the three gunas (Rajgun- Brahma, Satgun-Vishnu and Tamgun-Shiv) but has given the mantra jaap of them only. For them it is a request that this is not worship. We are living in Kaal’s lok. Here whatever facility we will need, Brahma, Vishnu and Shiv etc only will provide that. For example, we have taken an electricity connection (benefit). We have to pay its bill (expenditure). We are not worshipping the minister or the electricity department. We will pay their bill and keep getting the benefit of electricity. Likewise, if we will keep paying the bill of telephone and water etc, then we will keep getting the facilities. By doing sadhna opposite to the scriptures you have become devoid of bhakti i.e. you have become devoid of virtues. As a result of which, you are not getting wealth and other benefits etc. This Das (Rampal Das) will become your Guarantor (will take responsibility) and will again make available all the facilities from the powers (Brahma – Vishnu – Shiv – Ganesh – Mata etc) of the one brahmand of this Kaal lok to you, and you have to keep paying their bill by the jaap of this mantra. The first (Sat Sukrt Avigat Kabir) mantra is for worship; this is Purna Parmatma and Satam (i.e. complete salvation) benefit (fruit) will be attained. The meaning of Satam is eternal i.e. we have to attain the eternal state. After four months of this mantra, you will get Satnaam (Sachcha Naam / True Mantra), which will be of two mantras. One of its mantra is for paying the debt of the twenty-one brahmands of Kaal. By making its earning we have to pay the debt of Brahm (Kshar Purush) i.e. Kaal. Then this Kaal will make us free from all the debts. Translation: (Bharat) oh Bharat! You (sarvbhaaven) in every respect (tam) that Parmeshwar hidden in the darkness of ignorance (ev) only (sharnam) in the refuge (gachchh) go. (tatprsaadaat) by the grace of only that Parmatma, you (paraam) supreme (shaantim) peace and (shaashvatam) ever-lasting Sat (sthanm) Place – Dhaam – Lok (prapsyasi) will attain. Translation: Oh Bharat! You, in every respect, go in the refuge of only that Parmeshwar hidden in the darkness of ignorance. By the grace of only that Parmatma, you will attain supreme peace and the ever-lasting Sat Place–Dhaam–Lok. Translation: (sarvdharmaan) all my religious practices (mam) in me (parityajya) abandoning, you only (ekam) of that one Purna Parmatma (sharnm) in the refuge (vraj) go (aham) I (tva) you (sarvpapebhyaH) from all the sins (mokshyishyami) will liberate, you (ma, shuchH) do not grieve. Translation: Abandoning all my religious practices in me, you go in the refuge of only that one Purna Parmatma. I will liberate you from all the sins; you do not grieve. The meaning of the above-mentioned Shloks is that Kaal (Brahm i.e. Kshar Purush) is saying that Arjun, if you want to stay in my refuge, then your birth and death will continue. If you want supreme peace and want to go to Satlok, then go in the refuge of that Purna Parmatma. For that, leaving all my religious practices, i.e. the earnings of the jaap of the first mantra of Satnaam, with me, then, in every respect go in the refuge of that One (Almighty i.e. who is unequalled, that unique Parmeshwar), then I will make you free from all the sins (debts); you do not worry. And we will leave the earnings of the second mantra of Satnaam with ParBrahm i.e. Akshar Purush because we have to go to Satlok through Akshar Purush’s lok; we have to give its fare. Then we will get the third mantra Satshabd i.e. Saarnaam, which will provide permanence in Satlok. If someone has gone abroad, and there he owes money to the government. If he wants to return to his country, then he will have to first get rid of the debt of that country. Then will have to obtain a No Due Certificate. Then his passport will be validated for the return; otherwise, he will not be allowed to come back. Similarly, becoming devoid of bhakti by doing sadhna opposite to the scriptures, you have become indebted in this Kaal lok. First of all you will be made a merchant. For that, KavirDev (God Kabir or God Kabir) has sent me, this Das (Saint Rampal Das), as His representative. On the behalf of that Parmeshwar this Das will become your guarantor and will resume your connection (the benefit of connection) with Brahma – Vishnu – Shiv etc powers, for which by making an earning of their mantras you have to pay the bill in instalments. Until you become liberated from here, you will keep getting all the material facilities with full might, and by doing virtuous deeds – charity etc will be able to become richer in bhakti. 5. In Kanth lotus, Durga (Ashtangi). We will be able to go through these lotuses only when we will pay their debt. By the first updesh all your lotuses will blossom i.e. you will become free from debt. When at the time of death you will depart after leaving your body, then you will find your path clear i.e. you will find your all no due certificates ready. But we have to worship our Original Master KavirDev (God Kabir). Like, a wife, who is loyal to her husband, worships her husband, but respects everyone suitably. Like, younger brother-in- law as son and elder brother-in-law as an elder brother, and mother and father-in-law as her own mother and father. But the feelings she has towards her husband she can not have towards others. In a similar manner, a devotee of Kabir Parmeshwar has to make his bhakti successful. Therefore do not get misled by any ignorant person. Remain engaged on the path of bhakti directed by this Das with full faith. This bhakti is based on all the scriptures. 2. In the second stage Satnaam is given, which is of two mantras. One is (Om) + second is Tat which is coded, is only told to a worshipper. 3. In the third stage Saarnaam is given, which is of three mantras. Om + Tat + Sat (Tat – Sat are coded which will be told only to the worshipper). In this way, by the practice of the sumiran (chanting) of Saarnaam (which will be of three mantras), a worshipper will attain Param Divya Purush i.e. Parmeshwar KavirDev (Supreme God) and will attain supreme peace i.e. complete salvation in Satlok (eternal place). Important: Currently no one except me (Das) has this actual sadhna. If someone, stealing from this Das, himself becoming a guru, is making fake disciples, then beware of that enemy of the human life. He because of being unauthorised is ruining his life and is also making the ignorant followers destined to hell. Know him to be a messenger sent by Kaal.